Beyond its beautiful canals, abundance of bicycles and relaxed atmosphere, Amsterdam is also becoming a business hub. In recent years, the Netherlands’ capital city has become home to multinational tech corporations like Netflix, Uber, Amazon and Tesla. Now, many others are following suit, driving the city’s office market growth at record levels following the 2008 financial crisis. Amsterdam is the clearest example of the upturn the office market is enjoying in Europe as a result of the continent’s economic recovery. In the first half of 2017, take-ups increased by 85 percent in the Dutch city compared with the same period in 2016, according to data by commercial real estate company Colliers International. The trend includes other European capitals, such as Dublin and Berlin, where office occupancy increased by 80 percent and 35 percent respectively in the first half of 2017 against the first half of the previous year. Admittedly at different paces, cities are evolving positively, with employers not only moving to bigger offices, but also demanding additional workspace in order to boost their companies’ growth. Almost a decade since the start of the financial crisis that led to the worst recession in the EU’s history, the bloc recently officially put an end to this chapter of downturn. Despite some lingering caution among businesses, the economy has given signals of strong recovery, with sustained growth over the past five years. In August 2017, unemployment reached its lowest level since 2008, at 9.1 percent. This recovery hasn’t only raised the quality of life for Europeans, but has also accelerated the office market’s growth. Alex Colpaert, Head of EMEA Offices Research at JLL Capital Markets, explained the sector’s development: “Today, take-ups and investments are moving in the same direction. But this wasn’t the case in the past, as the occupational market was lagging behind investments.” Now, he added, things are different: “Take-ups have experienced an exceptional acceleration over the last two to three years,” he said. That said, analysts warn that speaking about Europe as a unit can be inaccurate. Despite economic cycles showing that the markets of countries in the EU roughly follow the same pattern, each one evolves at a different speed, and domestic politics have a significant impact. That said, uncertainty continues to play a role in businesses. He added: “London has started to move again in recent months, following a slowdown in the last part of 2016 and in the first quarter [of 2017].” Despite such shocks, London’s office market regained relative stability as 2017 progressed. The European market can be a tricky space when it comes to real estate, as demonstrated by the trouble London has had following the Brexit vote and the instability Barcelona is expected to experience due to the fight for Catalonian independence. Investment figures in the office market prove its volatility. In 2016, London’s difficulties negatively impacted the rest of Europe. Investment flow in the European office market totalled €105.3bn, a five percent decline from the previous year. Nevertheless, excluding the UK, investment volumes in continental Europe rose to €81.3bn in the same period, reaching a record eight percent expansion annually, according to Colliers International. In the last few years, the Netherlands has received attention for more than its colourful tulip fields and windmills. Thanks to its advanced digital infrastructure, Amsterdam is now host to several technology companies, which have transformed the city into a vibrant tech hub. This surging industry has prompted similar growth in Dublin. Amsterdam has not only outperformed the continent’s take-up market, but has done so faster than any other city. 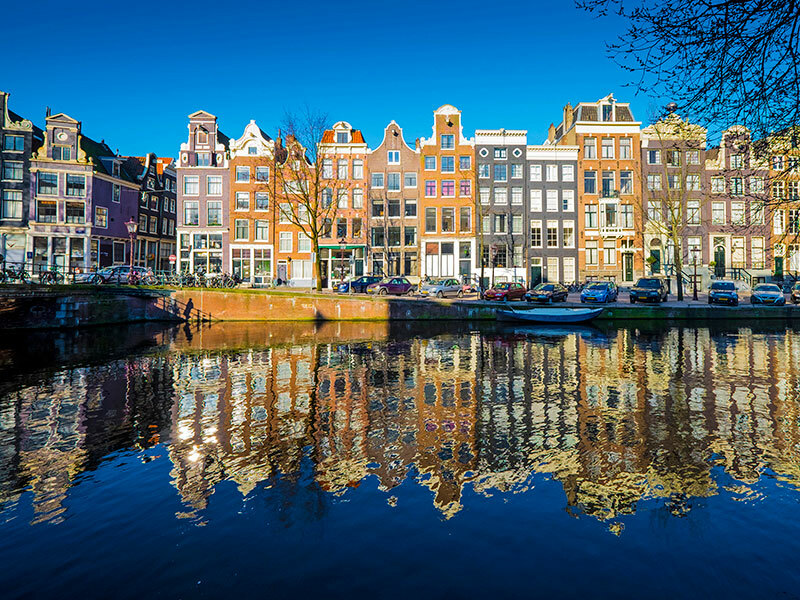 Kes Brattinga, Senior Research Analyst at Colliers, highlighted its main virtues: “International companies prefer Amsterdam because of its Central European location with good international connections, and well-educated, English-speaking workforce”. Uber chose to move its international headquarters to the city in 2012. In March 2017, it announced it would move its headquarters to a larger building, where it plans to add 600 employees to its current workforce of 400. Netflix, which has had its European central office in the city since 2015, opened a new European customer service hub in Amsterdam in May 2017. By the end of 2018, 400 new employees will be working in the building. Additionally, Amazon expanded its office space in 2017 by leasing an additional 4,800sq m in the east of Amsterdam. “Amsterdam expects to benefit [in] the longer-term from Brexit, and [has] forecasted an additional demand of 165,000sq m of office space per year,” Brattinga said. However, analysts think the city could run into trouble once its abundance of vacant space has become scarce. “Amsterdam is anticipating… higher demand by making new office development plans. As demand will also follow supply, the future [looks] bright for the Amsterdam office market,” said Brattinga. Offices are not exempt from the disruptions of the digital era. Today, workspaces are adapting to younger generations’ demands and new ways of working. In the office market, this desire for flexible space is transforming the make-up of traditional offices. According to Colpaert: “This is one of the biggest game changers in offices real estate.” In fact, UK-based corporate property manager JLL estimated that 30 percent of corporate portfolios will comprise flexible space by 2030. “The demand for flexible corporate space will become crucial, and investors will need to restructure their portfolio to profit from this trend,” he added. At present, traditional co-working players represent around 20 percent of office take-ups in London, and around 15 percent in Amsterdam, JLL estimated. The thriving activity in the office market is reflecting the prosperous economic environment in Europe at present. It took almost 10 years, but the clouds seem to have cleared, and with offices full of employees, European businesses are injecting new life into cities.